The Office of Vice Mayor and Sixth District Councilman Dee Andrews has announced the 31st Annual Martin Luther King Jr. Parade and Celebration happening on Saturday, January 19th, 2018 will go on rain or shine. The parade kicks off at 10:30am at the intersection of Martin Luther King, Jr. Avenue and Anaheim Street. 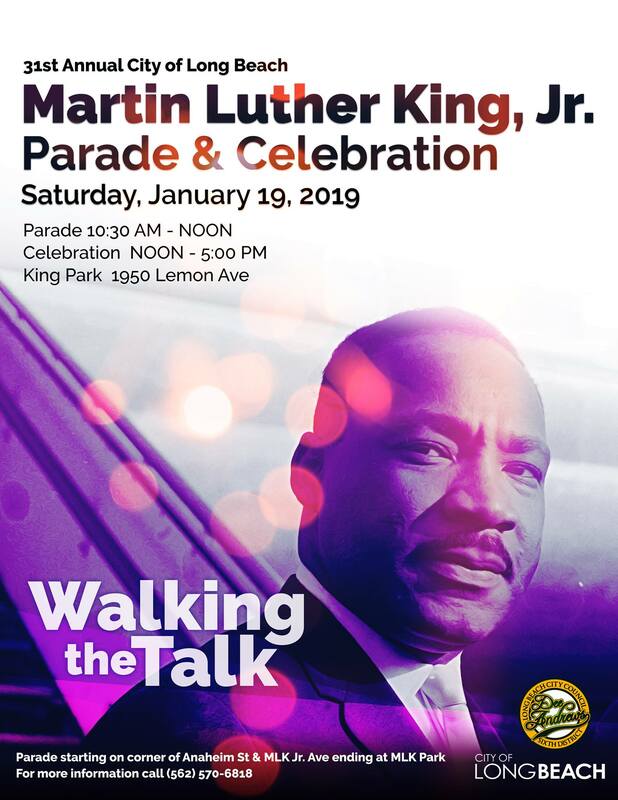 An open-air celebration with live entertainment, food, merchandise, and information vendors follows from 12:00pm to 5:00pm, at Martin Luther King Jr. Park, located at 1950 Lemon Avenue, Long Beach. The parade line-up has over 80 entries and it is hosting a variety of organizations such as, the Aquarium of the Pacific, Chosen Few Motorcycle Club and Viva Home Schooling Cooperative. Among the elected officials are Mayor Robert Garcia, City Auditor Laura Doud, Judge Christopher Frisco and representatives from the cities of Paramount and Huntington Park. A kids’ zone will be hosted by the Boys & Girls Clubs of Long Beach and will have face painters, a bouncy maze and other attractions. A total of 33 food, merchandise, and informational vendors have confirmed attendance. Among the booths are: JPs Pure Essentials selling hand-crafted jewelry and all natural body care products; Paparazzi Accessories selling jewelry; and The City of Long Beach’s Black Infant Health program. Psi Eta Chapter of Chi Eta Phi Sorority will be providing blood pressure checks and other health screenings. This year’s theme will be “Walking the Talk” and will celebrate community partners involved in social, environmental and human rights. Naomi Rainey-Pierson, the Long Beach branch president for the National Association for the Advancement of Colored People. Adam Hijazi and the Long Beach Collective Association Board. Mauna Eichner and Lee Fukui, environmental volunteers living in the 6th District’s Wrigley neighborhood. Philip Gonsal, who has been working with the Long Beach Fire Department for 19 years and currently holds the rank of engineer. Rich Archbold, The Press-Telegram’s columnist and public editor. For more information, please call 562-570-6816.